** Drop 7.5 pounds. Seems like a pretty big goal given the last few months, but if I put my mind to it things should be all good. Plus, I have all o’ ya’ll making sure I stick to it!! ** Run a minimum of 50 miles. I have a darn half marathon coming up in something like 45 days so…yeah…And I am so far behind on my 1000 miles for the year I need to really get to work!! 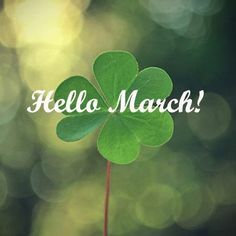 It helps that I’ve got my annual St. Patrick’s Day 5Ks coming up this month too – which is always motivating for me. ** Hit at least 20 Bikram classes and if I don’t start RIGHTNOW then there are going to have to be a couple of doubles weekends in there!! This year, I’m once again a Skirt Sports ambassador so I am working to perk up my running wardrobe a bit with a couple of new prints that have come out! Emerald City just might become my most favorite ever (as if I could choose a favorite!!) There isn’t a lot of non-neon green out there in the running apparel world!! And Free Love — yeah. Love it! Along with last season’s Tantrum, I’m really getting into the prints! You can get into the new prints – and some old favorites too!! And, with my ambassador code, you get 20% off!! Use coupon code ORF20 when you check out!! So, let’s all get to it and show March who’s boss!! ← New Month, New Attitude!